Jenny attended a My Avenging Angel WorkshopTM in 2011 and has been thriving ever since! Jenny will run the September 13th Ironman Challenge Cedar Point Race in Ohio as a fundraiser for CT-ALIVE, a non-profit agency supporting free workshops for women who have been abused. “I have always been someone who dreamed big and chased impossible goals, but it is still hard to wrap my mind around where this crazy Ironman journey has taken me. When I jumped head first into the world of triathlon, I didn’t know the first thing about swimming or cycling. In fact, I was deathly afraid of putting my face in the water. In spite of all this, I still wanted to do an Ironman distance race. I never could have imagined how much a single goal could change my life. My transition from runner to triathlete has truly been an example of “it takes a village.” I have found the most AMAZING role models, coaches, friends, and community along the way. My life is richer in ways I never could have imagined, and it makes all the hard work I’ve put in that much sweeter. However, the reason this event means so much more to me than any other goal I’ve attempted to date runs deeper than the past two years. For me, this race is about CLOSURE. Long before I met my husband Adam (aka The Love of My Life! ), I was in a relationship with a man who put me on a pedestal, and then systematically picked apart my self-esteem. I spent over five years of my life being manipulated and degraded by a man I thought loved me. It wasn’t until he put his hands on me that finally I realized how wrong I was. Leaving that marriage was THE HARDEST THING I HAVE EVER HAD TO DO IN MY LIFE. The shame, embarrassment, and self doubt that linger after abuse are something no women or person should have to deal with. When I left, I spent a long time trying to decide what to do with my rings. I easily could have used the money on something to make my life easier while I was starting out on my own; however, I wanted to use it for something significant. It was important for me to find a way to turn the negative into a positive. Ultimately, I sold them to buy a road bike with the intention of someday doing an Ironman. THAT is why this event is so important to me. Challenge Cedar Point is my comeback for every time I was told I wasn’t good enough and couldn’t handle any little thing. More than that, it’s a strike back for every victim of domestic violence who has been made to feel less than. Everyone deserves to be loved, dream big, and feel safe at night. I was lucky to have the resources available when I needed them most. Now I push my physical limits to make sure other women have the same opportunity. Every year I pick my most difficult race as a fundraiser for CT Alliance for Victims of Violence & Their Families Inc. (CT-ALIVE) in an effort to give back to the organization that helped me take control of my life again. I will not ever allow another person tell me I can’t or that I’m not good enough; and I hope I am setting an example for other women and victims of abuse to do the same. The only limitations in life that matter are the ones we put on ourselves. For more about CT-ALIVE and to make a donation, please visit www.ct-alive.org. For more about Jenny, the Running Thriver, visit her blog at www.runningthriver.com and Running for the Color Purple. 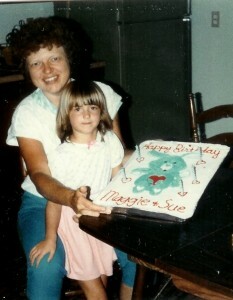 Maggie and Susan share a birthday — and a Care Bear cake — in 1985. Each year, Susan Omilian celebrates her birthday on August 23rd which she shares with her niece Maggie by asking for donations to the CT-ALIVE Scholarship Fund. Maggie was shot and killed at age nineteen by her ex-boyfriend on a college campus in Michigan. After Maggie’s death, Susan vowed to help women who had survived abuse to move on and “thrive” as Maggie could not. This innovative work which provides free services to women is supported by CT-ALIVE. Find the voice inside that knows you have what it takes to make your dreams come true and listen. Turn up the volume. Make it loud. It was a great day today for the February 28 Archangel Follow-up Session! We did our Vision Boards for 2015, starting with “The List of Threes”…. three things we love, three things we are grateful for and three things we are looking forward to. Try this exercise yourself! It’s one of many exercises set forth in The Thriver Workbook: Journey from Victim to Survivor to Thriver! Join the Archangel Community. Take a free My Avenging Angel WorkshopTM. Next workshop in Connecticut is March 7th and 14th. Register now! Here’s a piece written by one of the participants from a writing prompt at the My Avenging Angel Workshops that I conducted in Connecticut last weekend. – Not care about others’ judgments. – Express my love again. YES! I’m reading this piece aloud every morning so it can sink into my head! I have a few of the lines posted on my computer monitor, like “I’m dreaming big” and “Have no limits.” How about you? If you would like more writing prompts from the workshops, check out The Thriver Workbook: Journey from Victim to Survivor to Thriver which contains all the writing exercises and motivational guidance I use in the workshops. Preview the workbook here. You can purchase it at www.thriverzone.storenvy.com. Did you see this Super Bowl Ad? If you watched the Super Bowl game on Sunday, you probably saw this ad. It was billed as the “first anti-domestic violence” ad ever — actually it is a public service announcement produced as part of the No More campaign with the help of the National Football League (NFL). The ad portrays in a subtle but powerful way how a victim of domestic violence feels — scared, alone, vulnerable and unsure that she’ll find a way out. In the ad, the victim calls 911 in the middle of a dangerous situation but pretends to be calling for pizza delivery so that she can get the police to her house without warning her abuser that she has reached out for help. It’s a chilling ad that I hope educates and reminds the viewing public what a victim of domestic violence experiences and how she must use all her resources to take that first step, boldly and courageously, to identify as a victim and get out of the abuse! I applaud the women who have done it and the domestic violence and sexual violence crisis intervention programs around the world that provide them services to do that safely. My niece, Maggie, a nineteen year old college student who was a victim of dating violence in 1999, did not have that chance. Her ex-boyfriend shot and killed her and then himself. There had been no signs of physical abuse in their relationship, he made no threats to harm her physically beforehand and she didn’t know he had a gun when she went to his dorm room that night, I believe, to tell him one more time to leave her alone. Before her death, Maggie didn’t identify as a victim of abuse or realize how much danger she was in. She was not able to call on the police, the courts and domestic violence crisis services to help her take that next step from victim to survivor. If she had survived, I know that today she would be talking to women everywhere telling them that help is out there and that they don’t have to live with abuse and violence in their lives. But I believe there is third step beyond abuse that Maggie also did not live to experience. That is the critical “next-step” of moving from victim to survivor to “thriver! Since 2001, I have conducted the My Avenging Angel Workshops™ in Maggie’s memory and helped hundreds of women find that “living well is their best revenge!” In addition, my book, The Thriver Workbook: Journey from Victim to Survivor to Thriver! published in 2010, sets forth the motivational guidance and interactive exercises I have successfully used in my workshops. My workshops and workbook help women discover their hidden talents, quiet the negative inner critic, bring positive energy into their lives and set new, short and long term goals for themselves and their children. Since Maggie didn’t live beyond her moment of realizing she was being abused, I now work with women to help them discover the daring, exciting and creative futures beyond abuse that they so richly deserve. So just as it is important for efforts like No More Super Bowl ad to educate the public about domestic violence, I believe that we must also support women in rebuilding their self esteem and reclaiming their lives after abuse. This is the work I do and it’s more than a workshop or workbook that I’m promoting. I believe it is a movement to help women permanently break the cycle of violence in their lives and thrive after abuse. A “thriver” is a happy, self-confident and productive individual who believes she has a prosperous life ahead of her. She is primed to follow her dreams, go back to school, find a new job, start her own business or write her story. She believes in herself and in her future so much that she will not return to an abusive relationship. She speaks knowledgeably and confidently about her experiences and is not stuck in her anger or need for revenge. Living well is her best revenge and she has found a network of women who understand and share her desire to move forward after abuse. This is a definition in progress because so many of the women I have met in my workshops and through my workbook are doing such amazing things today — way beyond what I ever imagined my work might produce! They have started their own businesses, returned to school to get advanced degrees in law and medicine, got new jobs at higher pay or that more closely match to their skills and talents, resumed singing careers, become first-time homeowners, successfully managed their money and found new, healthy, non-abusive long-term relationships and a happy life for themselves and their children. This is only the beginning of our movement. Let’s make it our goal to not only get women out of abuse, but also free them from the grip of low self-esteem, emotional fear, shame guilt, and hopelessness that come as the devastating, long-term consequences of abusive, destructive relationships. Let’s have them THRIVING in peace, joy, freedom and love. They deserve nothing less! To learn more about Susan Omilian’s cutting-edge work, visit the Thriver Zone! (www.thriverzone.com) The Thriver Workbook and Companion CD are available there in the website Store. The workbook is also available on Amazon.com. Check out the three winning entries of the “I am a Thriver” essay contest about the journey from victim to survivor to thriver. For more about this journey, visit thriverzone.com. My Avenging Angel Workshops this Fall, 2013 are FREE! Described by participants as “life-changing,” My Avenging Angel Workshops™ provide the critical “next step” for women to break permanently out of the cycle of violence and “thrive” after abuse.